The all-season Michelin Defender XT tire combines exceptional durability with superb comfort and stability. It features the MaxTouch technology to ensure long tread life while the EnergySaver technology minimizes rolling resistance to boost fuel efficiency. In wet conditions, grooves remove water and slush from the contact patch to enhance safety while sipes enhance grip. The IntelliSipe technology delivers interlocking action to improve braking and minimize rolling resistance for better fuel efficiency. 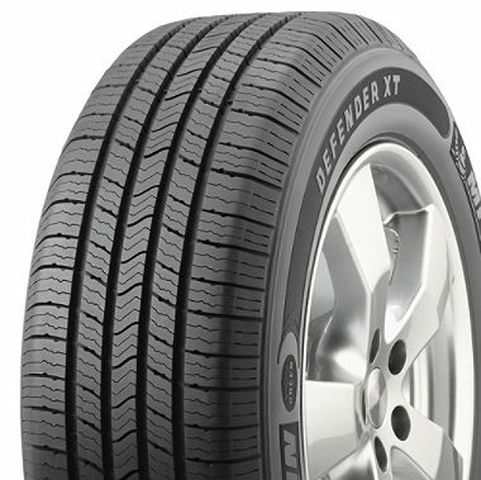 Purchase includes the Michelin Defender XT tire only. The wheel rim shown in the picture is not included. Picture provided is a stock picture from the manufacturer and may or may not reflect the actual product being ordered. All Michelin Defender XT tires are continuously developing with manufactured improvements. With that said, Simple Tire and the manufacturers have the right to change these tire specifications at any time without notice or obligation. Please Note: Specifications of the Michelin Defender XT tires shown above are listed to be as accurate as possible based on the information provided to us by Michelin tires. This product is covered by a 90,000 mile manufacturer’s treadlife warranty. The Defender XT P225 60R17 90K Tires were quite a deal for me, I will be a repeat customer for all my vehicle tires. By submitting a review, each person received a sweepstakes entry. I have only had the tires on my car for 6 weeks, but they have handled the road well, even with heavy rains. They are quiet, also. And simpletire shipped them to my installer quickly and they were on my car within a week. By submitting a review, each person received a sweepstakes entry.